The design envisages extending the museum along a central axis, in keeping with the museum’s historic spatial sequence. The new rooms for the collection are accessed via the foyer, which, along with the system of circulation, is re-designed in order to make the whole building barrier free. The rooms for special exhibitions are connected directly to the foyer and to the new exhibition spaces for the permanent collection. Administration, the Metzler Auditorium and the library are re-located to the west wing. The new space for the art of the second half of the 20th century is located in the ‘garden halls’ beneath the Staedel garden. The central room is dominated by an elegantly curved and seemingly delicate ceiling with circular rooflights. The curve in the ceiling emerges above ground as part of the new garden’s topography, like a piece of land art, and can be used as an outdoor extension to the foyer. The compact underground building form, the method of heating and cooling, the pre-warming and pre-cooling of air and the large internal storage mass together create an optimal room climate with minimal energy consumption. 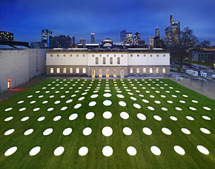 “Frankfurt not only receives a very special, unique new exhibition venue, but also a truly green building which is right at the height of its time.” (excerpt from the jury report).